Its about time that I provide an update on the album launch and another show. Its taken some time to sort out, but we will be launching the Curlew album at the Bearded Lady on Sunday 16 November. 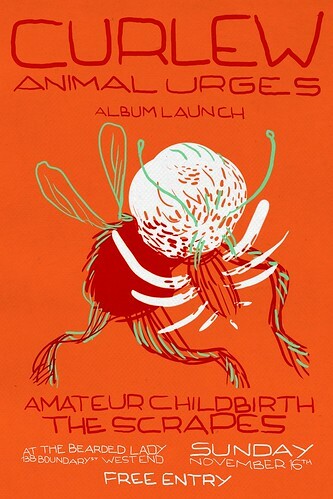 Yes, this is the last day of the G20, yes its probably not the best and easiest date to launch an album. But I must admit I forgot. I had original booked the launch for November 20. However the Bearded Lady had a request from a Greek band for that date. I wanted to help the venue out, as Cat the booking agent has been lovely to deal with, so I agreed to change our date. As circumstances changed, that band had to pull out and Cat was nice enough to suggest I play a solo show on that date. Don’t worry to much about the G20, come out and see us play, it might take a touch more time to get there, but you might see Putin or Obama wonder in for a beer, who knows. So the upcoming shows are as follows. Thank you to Kellie for this poster. I am really excited about both shows. The Curlew show will be like old times, just Callum and myself playing some songs from the album. For the solo show I will playing a mixture of I am not a Nihilist songs, some solo guitar stuff and a couple of newer songs that we have been working on for the next Curlew release. As Nick is going away for a month for work we did some quick demos of the new songs, just in case he forgets his parts. Here is one of them. 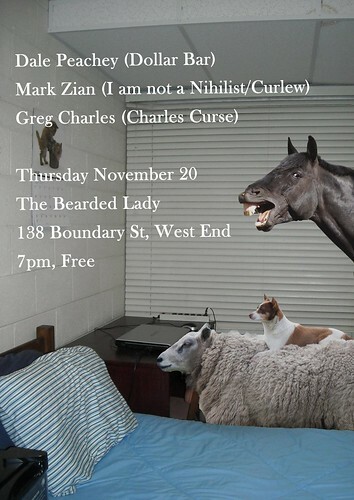 Posted in Curlew, Gigs, News, Songs and tagged with brisbane, curlew, markzian, the bearded lady. RSS 2.0 feed.